Prone for posterior spine procedures: For posterior procedures, the prone position with Mayfield pin fixation is preferred. 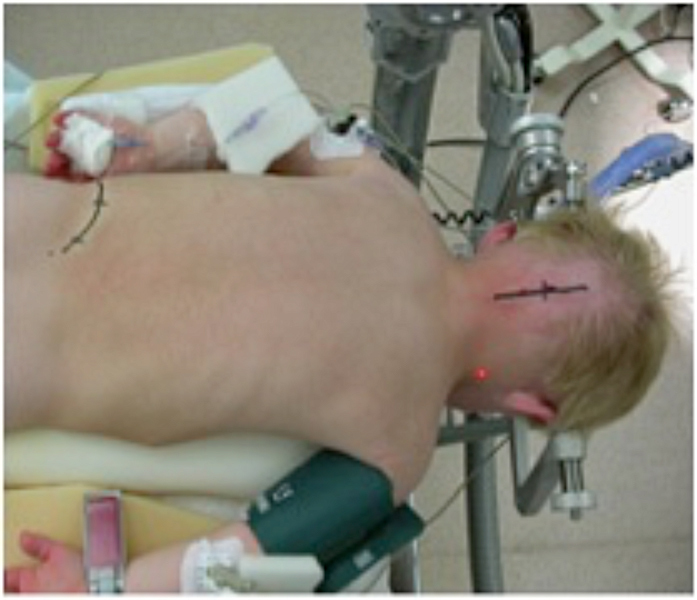 Great care is taken when turning the patient from the supine to the prone position, and intraoperative electrophysiological interrogation may be necessary before and after turning the patient. Supine for anterior spine procedures: For anterior procedures, the supine position is used. 5–15 pounds of traction: For anterior procedures, Halter traction with 5–15 pounds of weight (depending upon level) is routine, both to aid in exposure and to keep the patient in axial alignment. 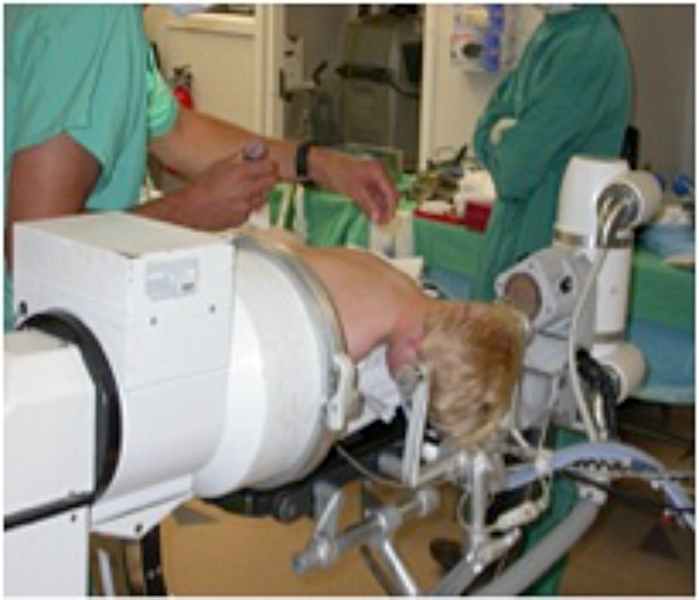 Operative set-up with fluoroscopy: The patient is prone in preparation for posterior occipitocervical fusion. Midline posterior incision: Intended incision for posterior occipitocervical fusion. Optimize positioning with fluoroscope: Once the patient is in the initial position, the intraoperative fluoroscope is brought in. A true lateral view is obtained, and final positioning is performed. For instance, if a C1-2 transarticular screw fixation is planned, the head and neck must be re-aligned to a “military sniff position,” with slight distraction and gentle flexion. This position greatly facilitates screw placement. For anterior procedures, the fluoroscope is used to confirm levels and plan the incision. 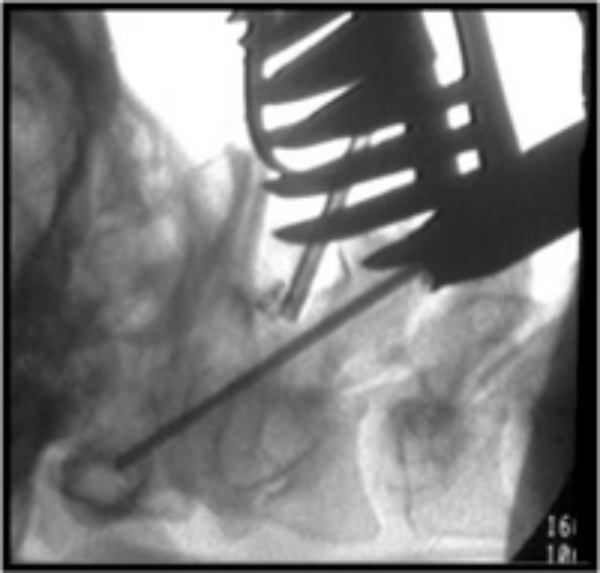 Intraoperative fluoroscopic image during C1-2 transarticular screw placement: The drill is seen traversing the C1-2 joint into the lateral mass of C1. Midline skin incision for posterior procedures: A midline occipitocervical, cervical, or cervicothoracic incision is used for posterior procedures. Transverse, right paramedian skin incision for anterior procedures: Anterior procedures are typically done through an anterior cervical incision on the patient’s right side. Confirm trajectory using anatomy and fluoroscopy: All relevant anatomic structures are identified with fluoroscopy, and self-retaining retractors are placed. Reduction: As noted above, reduction of a pathological spine curvature or other anomaly is typically performed just prior to final positioning and tightening of the rods or plates. Fusion: For posterior procedures, the next step is typically to harvest an iliac crest or rib autograft. Allograft may be used in certain circumstances, such as for spinal fusion after C1-2 interspinous wiring. The graft is cut and molded to shape, with all fusion surfaces decorticated with a high-speed drill. The graft is typically held securely in place with multi-stranded cables and/or small fragment fixation screws. Fusion adjuncts such as demineralized bone matrix or bone morphogenetic protein are then added to the construct. Routine closure techniques are used.